Commercial aquaculture farmers in Hawaii and the U.S.-affiliated Pacific islands are dependent on imported feeds to sustain their businesses, as there are currently no commercial feed mills in the region. This situation has created a huge financial burden to the farmers and has significantly limited the expansion of local agriculture and aquaculture to enhance food security and island sustainability. In an effort to address this issue, CTSA is supporting two ongoing projects to develop local feeds for tilapia and moi at the Oceanic Institute of Hawai’i Pacific University (OI) Feeds Research and Pilot Production Facility in Hilo, Hawaii. The project “Development of Cost-Effective Aquatic Feeds Using Locally Sourced Ingredients” is aiming to produce practical extruded tilapia feeds at the newly-built feed mill in Hilo. The first steps of the project were to collect and analyze new local feed ingredients such as tuna fishmeal from America Samoa, defatted haematococcus, spirulina, corn, and coconut meal, and to procure low priced commercial feed ingredients such as soy bean meal and wheat flour (Tables 1 & 2). 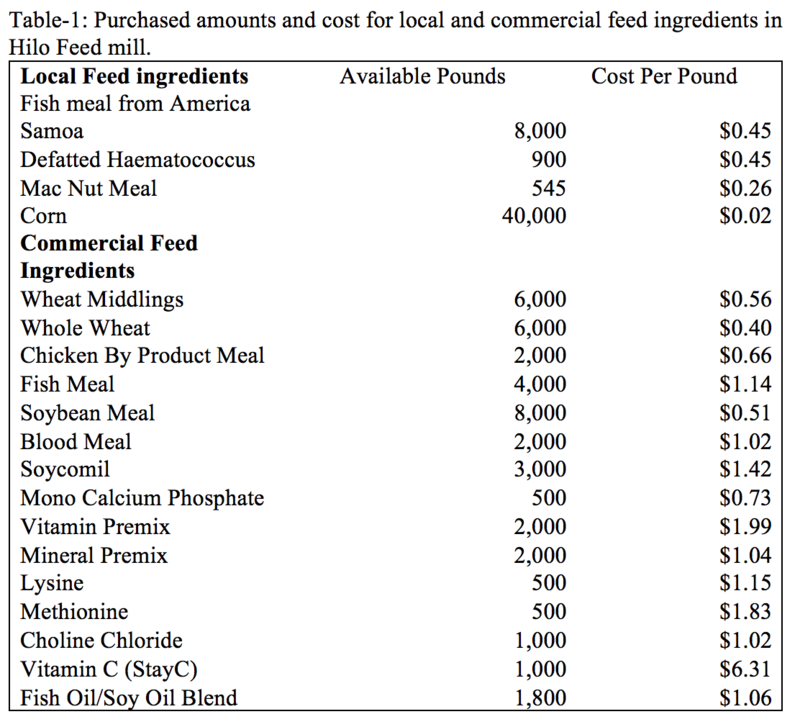 Researchers at University of Hawai’i at Hilo PACRC then utilized feed formulation software to formulate tilapia feeds based on the following criteria: 1) nutrient requirement of the target species; 2) nutritional quality of local ingredients; 3) unit price of protein and carbohydrate ingredients; and 4) requirements for practical feed processing. 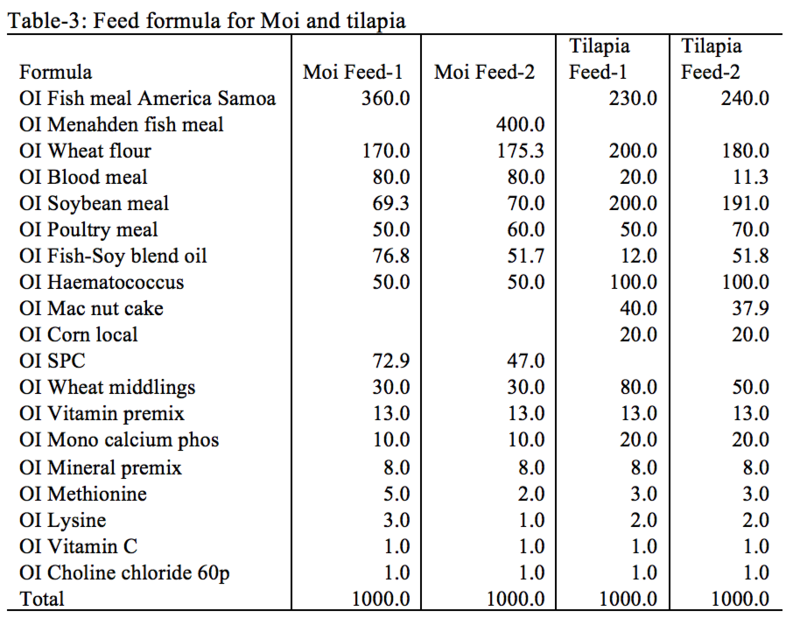 Two tilapia feeds, Feed-1 and Feed-2 were formulated and prepared in Hilo (Table 3). Tilapia Feed-2 was formulated with high lipid content (~10%) since local tilapia farms like to increase fat content in their tilapia products. However, the lipid contents in processed tilapia diets were lower than formulated lipid contents, probably due to the coating process that did not bind all added oil to feed pellets. Half of the two feeds (one ton) were transported to OI for testing in the Makapu’u laboratory, where they are currently being compared to a commercial feed that is sold in local markets. Each of the three diets has been assigned three replicated tanks (2000L), and each tank has been stocked with 55 juvenile tilapia (~20g/each). The trial is not complete, but researchers have observed higher active eating among the tilapia in the local feed groups versus the commercial feed group. The remainder of the two feeds was sent to four farms (2 farms on the Big Island and 2 farms on Oahu) for comparison testing. The trials will be completed by the beginning of 2019; initial reports from the farmers are that tilapia like to eat the local diets very much, and farmers are interested in purchasing the products if the prices are comparable to commercial feeds. In addition, the American Samoa Community College is currently conducting a Nile tilapia feeding trial to compare OI tilapia feed with their own processed tilapia feed. The research group experienced some challenges and delays, primarily related to the production equipment, technology, and manpower at the feed mill. For example, about half of the first feed pellets produced were sinking instead of floating, as required for tilapia diets. Earlier this year, OI brought in international feed extrusion expert Peter Hutchison from New Zealand to train its processing team, set up the production system, and adjust the control line. The team was finally able to produce feed pellets with 100% floating consistency, which is better than current commercial tilapia feed available in Hawaii Markets (floating pellets <90%). 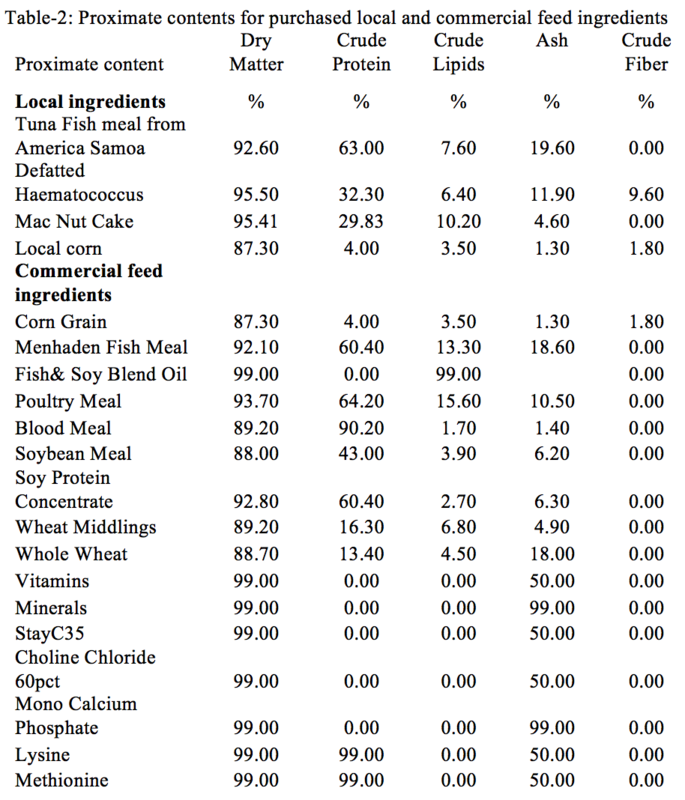 Simultaneously alongside the tilapia project, researchers have been working on the project “Cost-effective, local aquatic feeds for carnivorous and omnivorous fish with varying physical characteristics.” Under this project, two moi diets have been formulated by Dr. Armando Garcia-Ortega with least-cost computer software for new Feed Mill processing, as shown in Table 3. The Moi feed Feed-1 and Moi Feed-2 were formulated with local feed ingredients and low-priced commercial feed ingredients. The OI finfish department had two successes hatching Moi larvae and growing them to juveniles. They also successfully tested shipment of moi juveniles to PACRC on the Big Island. The first time resulted in complete mortality, but the most recent shipment was successful and the fish are now growing to the appropriate size for trials. As soon as the fish average weight is around 60 g (within a few weeks), each diet will be tested in triplicate cages. The outcomes of this research activities will directly and indirectly benefit local tilapia and moi farming, ingredient producers and the aquaculture industry. The information will also provide baseline methods for formulated feeds, feed processing and tilapia and moi culture in Hawaii and the Pacific region in the future. Production of local feeds will open the feed market to local industries including agriculture, biofuel and fisheries.